As you can see I have 1 server and 2 clients, one of them is a GNU/Linux PC. You don’t really need the GNU/Linux PC for this lab, I used it exclusively to run some personal tests. I have to tell you that I decided to run Windows Server in VmWare Workstation (I used version 11). I decided to go for that for 2 reasons: first GNS3 is going to be very soon updated with full support to VmWare so we will be able to use guests in VmWare more or less in same way we are doing now with VirtualBox. 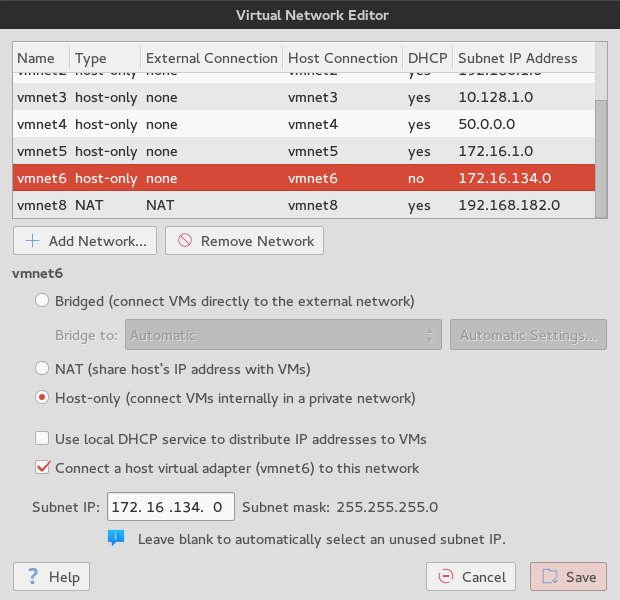 Second reason is that I wanted to have an overview of the current interaction between VmWare and GNS3 under GNU/Linux, also because this is slightly different than how it works using Windows as Host. 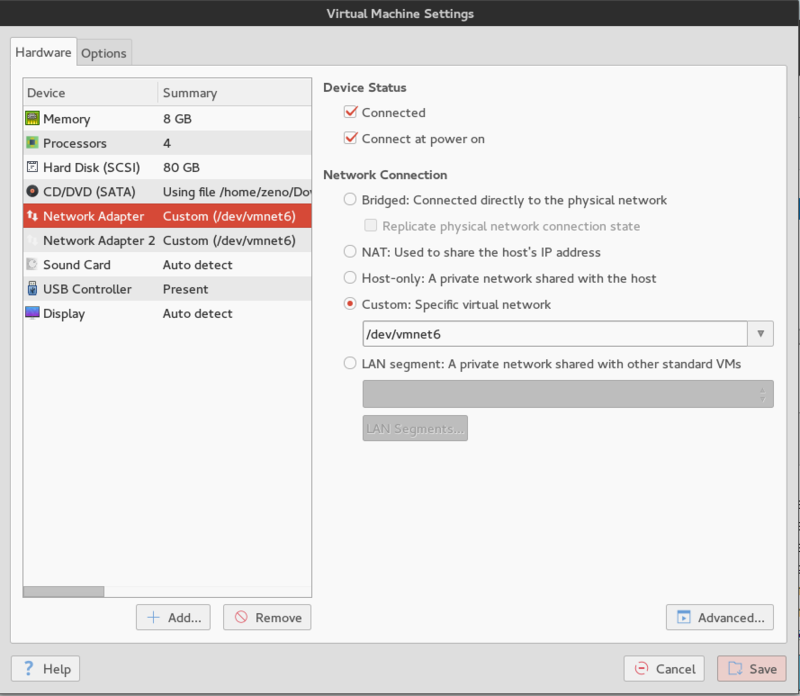 The goal of this blog post will be to show you how to configure your GNU/Linux box to use Windows Server with VmWare and how to configure the switch and Windows Client to use port based 802.1x authentication. In particular we want that the PC client will get access to the Network ONLY if the user is authenticated toward the Active Directory. This will give the opportunity to better understand the protocols and how to manage them in case you will be asked to implement them in a real world. I will not cover the configuration of the Windows Server and I will not show you how to have Win7 PC joining the Windows domain. For that I will only give you some links that will guide you through the necessary steps if you don’t know what to do. Let’s start, then, preparing our GNU/Linux Host to have VmWare “talking” to GNS3. As you probably know at the moment the only way to achieve this goal is to use the GNS3 Cloud. Actually I am using Fedora 21 as Linux Host but commands I will use in the Terminal are valid also with other distributions. By default, when you install VmWare, it creates 3 new network interfaces (vmnet0, vmnet1, vmnet8). You can double check your current interfaces typing the command “ifconfig” in your GNU/Linux console/terminal. It is important to unselect the option to use DHCP. For the Subnet IP you can use whatever you prefer because we are going to remove the configuration very soon. It is possible that you receive a message of error when you try to use tunctl. If so, you need to install tunctl utility. The same will be with brctl and in that case you will need to install bridge-utils package. Please refer to your GNU/Linux distribution for that. Moreover, in the first command please change <your_username> with the name of the user that will run GNS3. 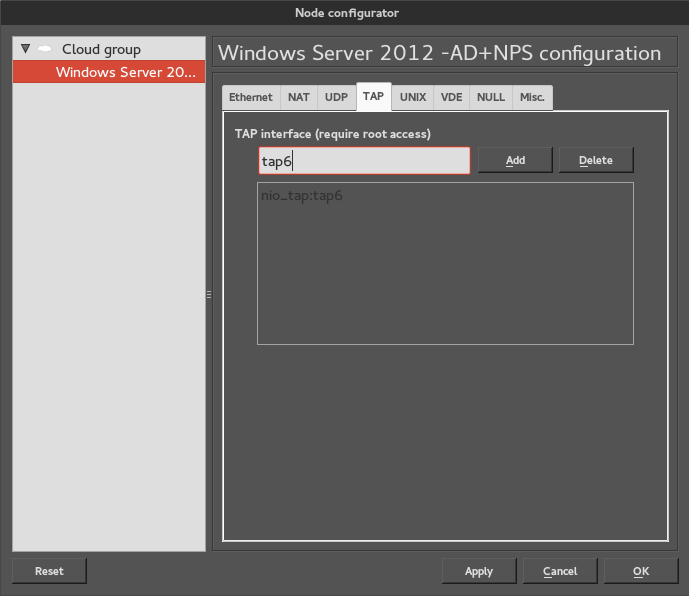 I also changed the name of the Cloud to Windows Server 2012-AD+NPS in the “Misc.” Tab as well as the symbol of the Cloud to the one of a Server. At this time the switch configuration is not touched at all. Links are in the default VLAN 1 and there is no security configuration or any other feature active. Is now time to configure 802.1x! In our LAB we will have Win7 as Supplicant, IOU Layer2 switch as Authenticator and Windows Server 2012 as Authentication Server. It’s worth to mention that a very important role will be the one of the Windows Server that will act as a Radius server for the authentication and will at the same time provide authorized username/password from Active Directory that is configured on same virtual machine. As I told you before I will not cover the configuration of Windows Server but you can follow this guide to prepare your virtual machine (even if it is for Windows Server 2008 and for WiFi authentication, you can adapt for your scope without issues as I did for myself). Is now time to finally configure the switch! It is possible to configure several features thanks to 802.1x but what we are going to do is a very simple one where the switch will keep the port in non-authorized state until the authentication with EAPOL will positively occur. It is clear that this is what we wanted to have as a result before the client will be authenticated! Hi Stefano, very good post! By the way, which IOU version are you using here? I am having problems with 802.1x on emulated platforms, it simply doesn’t work for me. I just double checked and I used an old L2 version compiled at July-26-2013… to be honest I thought I was using a more recent version. What kind of issues are you experiencing and on what image? Stefano, thanks for letting me know. I will give it one more try, I may have goofed up on some config. Thanks for your quick response back, I appreciate it. How did You add Windows 7 Client to GNS3 topology? As a separate host or is it inside Cloud? I added a separate Virtualbox host. « [Networking – Lab] Ready-to-go GNS3 Switch and Routers config for your lab.